The brake pedal moves when cruise control brakes the vehicle. A foot in the area under the brake pedal could become trapped. The movement of the pedal, and therefore the vehicle's ability to brake, may be restricted by objects in the area under the brake. There is a risk of an accident and injury. Do not place your foot under the brake pedal. Keep the area under the brake pedal free from obstructions. If you fail to adapt your driving style, cruise control can neither reduce the risk of accident nor override the laws of physics. Cruise control cannot take account of road, weather and traffic conditions. Cruise control is only an aid. You are responsible for the distance to the vehicle in front, for vehicle speed and for braking in good time. Adjust your driving style to the traffic conditions. Only engage cruise control when the current road, weather and traffic conditions permit it to be done safely. Drive carefully and maintain a suitable distance to the vehicle in front. Cruise control maintains a constant road speed for you. On long and steep downhill gradients, especially if the vehicle is laden, you must select shift range 1, 2 or 3 in good time. By doing so, you will make use of the braking effect of the engine, which relieves the load on the brake system and prevents the brakes from overheating and wearing too quickly. Use cruise control only if road and traffic conditions make it appropriate to maintain a steady speed for a prolonged period. You can store any road speed above 20 mph (30 km/h). When you activate cruise control, the stored speed is shown in the multifunction display for five seconds. ► Briefly press the reset button on the instrument cluster. To activate cruise control, all of the following activation conditions must be fulfilled: • the parking brake must be released. • you are driving faster than 20 mph (30 km/h). ► Check whether LIM indicator lamp 2 is off. If it is off, cruise control is already selected. LIM indicator lamp 2 in the cruise control lever goes out. Cruise control is selected. You can store the current speed if you are driving faster than 20 mph (30 km/h). ► Accelerate the vehicle to the desired speed. ► Briefly press the cruise control lever up or down 4. Cruise control may be unable to maintain the stored speed on uphill and downhill gradients. The stored speed is resumed when the gradient levels out. Cruise control maintains the stored speed on downhill gradients by automatically applying the brakes. If you call up the stored speed and it is lower than the current speed, the vehicle decelerates. If you do not know the stored speed, the vehicle could decelerate unexpectedly. There is a risk of an accident. Cruise control is activated and adjusts the vehicle's speed to the last speed stored. If no speed is stored, cruise control stores the current speed and maintains it. Keep in mind that it may take a brief moment until the vehicle accelerates or decelerates to the set speed. 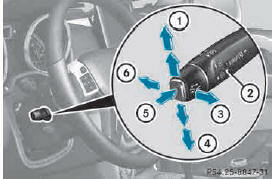 ► To increase the speed: press the cruise control lever up 1. ► To decrease the speed: press the cruise control lever down 4. ► Briefly press the cruise control lever up 1 for a higher speed or down 4 for a lower speed. The last speed stored is increased or reduced. 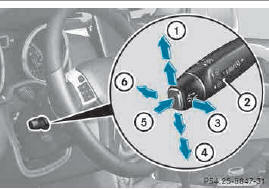 ► Briefly press the cruise control lever up 1 or down 4 to beyond the pressure point. There are several ways to deactivate cruise control: X Briefly press the cruise control lever forwards 6. Cruise control is automatically deactivated if: Ryou apply the parking brake. Ryou are driving at less than 20 mph (30 km/h). RESP® intervenes or you deactivate ESP®. Ryou shift the transmission to position N while driving. The last speed stored is cleared when you switch off the engine.